Bartholomeus Spranger (1546–1611), Glaucus and Scylla (1580-82), oil on canvas, 110 × 81 cm, Kunsthistorisches Museum, Vienna, Austria. Wikimedia Commons. As Ovid brings Book 13 of his Metamorphoses to a close, we are with Aeneas on Sicily. Scylla has been combing the hair of Galatea, who told the tragic story of the death of her lover, Acis. Ovid then takes back the narration for the story of Scylla, which he cunningly divides between the end of this book, and the start of the next. and at his waist merged into a twisted fish. Glaucus could tell what she was thinking, and assured her that he was a sea-god. He had once been an ordinary mortal, and fished with nets, and rod and line. One day, the fish that he had caught started to move when he had laid them out on the grass, and one by one they escaped back into the water. He couldn’t understand how that had happened, so chewed stems of the plants which they had rested on. As soon as he swallowed it, he was transformed and swam off in the sea. He visited the gods Tethys and Oceanus for removal of the last remains of his mortal form, then saw his new appearance. Scylla ran off, leaving Glaucus angry, so he made his way to the sorceress Circe, where Book 14 starts. Such a short story at the end of the book could easily have been overlooked by artists, but on this occasion it has inspired several wonderful paintings. 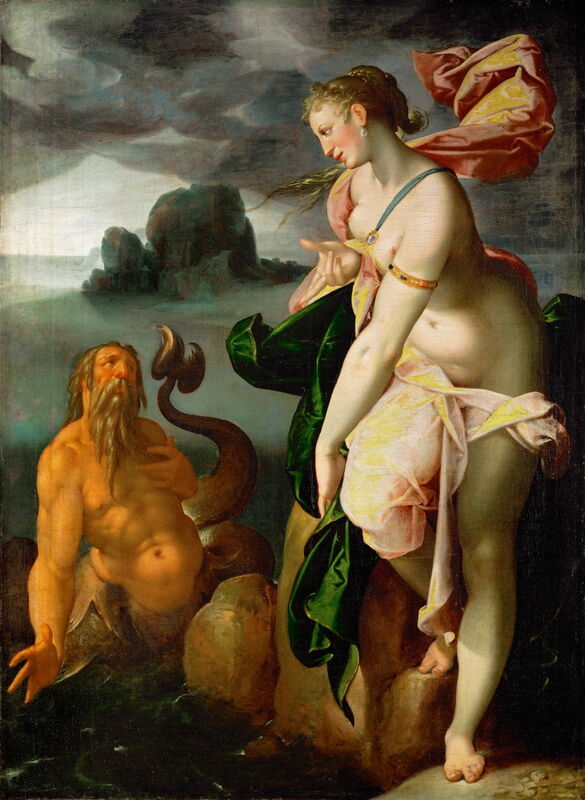 Bartholomeus Spranger painted his version of Glaucus and Scylla in 1580-82. Although the artist hasn’t followed Ovid’s distinctive colour scheme for his body, Glaucus is clearly pleading his case before the beautiful young woman. In the next book, Ovid will describe how Scylla was turned into a rock, and Spranger provides that link forward in the story in his background. Salvator Rosa (1615-1673), Glaucus and Scylla (date not known), oil on canvas, 87.5 x 75 cm, Musée des Beaux-Arts de Caen, Caen, France. Wikimedia Commons. In the middle of the seventeenth century, Salvator Rosa makes Glaucus more of a beast, roughly mauling Scylla’s fair body and giving her thoroughly good cause for her flight to the cliff. Nicola Vaccaro (1640–1709), Glaucus fleeing from Scylla (date not known), oil, dimensions and location not known. Wikimedia Commons. A little later, probably in the late seventeenth century, Nicola Vaccaro is more sympathetic in his Glaucus fleeing from Scylla. Glaucus may be a bit rough, but arouses more pity. 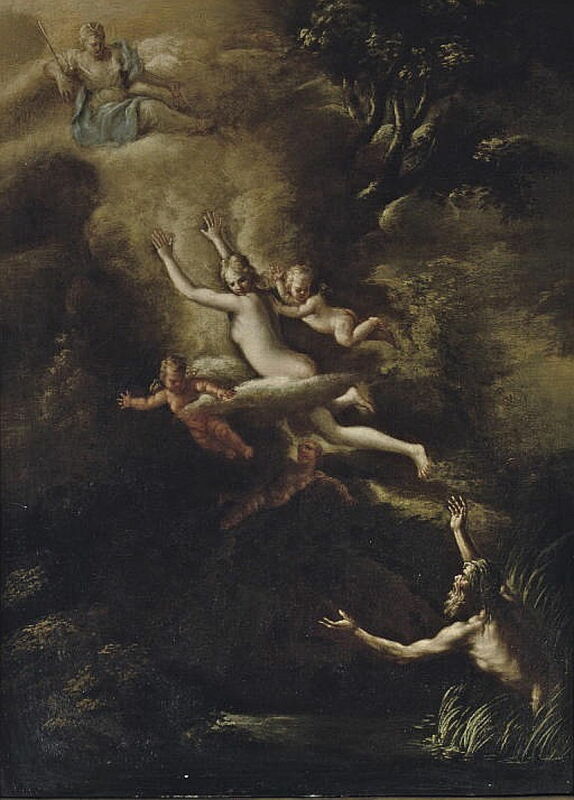 Scylla is accompanied by three Cupids as she flees not to the top of a cliff, but to the goddess Diana above. Superb though these are, by far the most interesting and unusual depiction that I have found is JMW Turner’s, from 1841, just a decade before his death. Joseph Mallord William Turner (1775–1851), Glaucus and Scylla (1841), oil on panel, 78.3 x 77.5 cm, Kimbell Art Museum, Fort Worth, TX. Wikimedia Commons. Turner’s Glaucus and Scylla (1841) would perhaps have looked more at home among paintings made fifty or even eighty years later. The naked Scylla is on the beach at the right, with a couple of cupids flying about. The rather inchoate figure of Glaucus is emerging to the left of centre, holding his arms out towards Scylla. She will have none of it, though, and has already turned to run, and looks back over her shoulder towards him. We look directly into the setting sun, which has coloured the world a rich gold. In the right background the low coastal land rises to sheer cliffs, on top of which is a temple. A tower atop a nearer pinnacle, or more distant lower red rocks, may be a reference to Scylla’s fate. 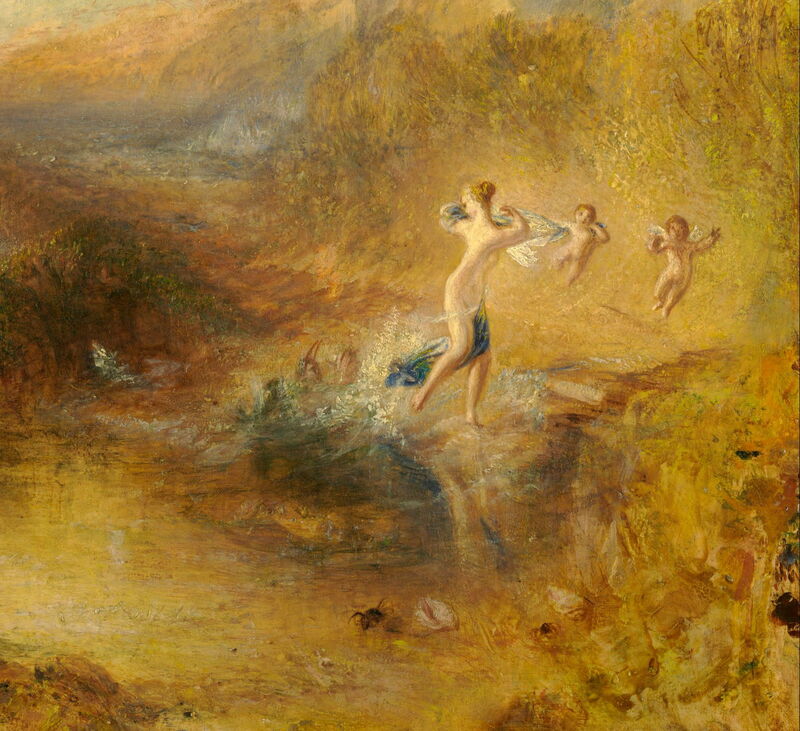 Joseph Mallord William Turner (1775–1851), Glaucus and Scylla (detail) (1841), oil on panel, 78.3 x 77.5 cm, Kimbell Art Museum, Fort Worth, TX. Wikimedia Commons. In the foreground are clues of the beach setting, with a crab, and several seashells. Turner has applied his paint in innovative and gestural ways, resulting in richly varied textures. 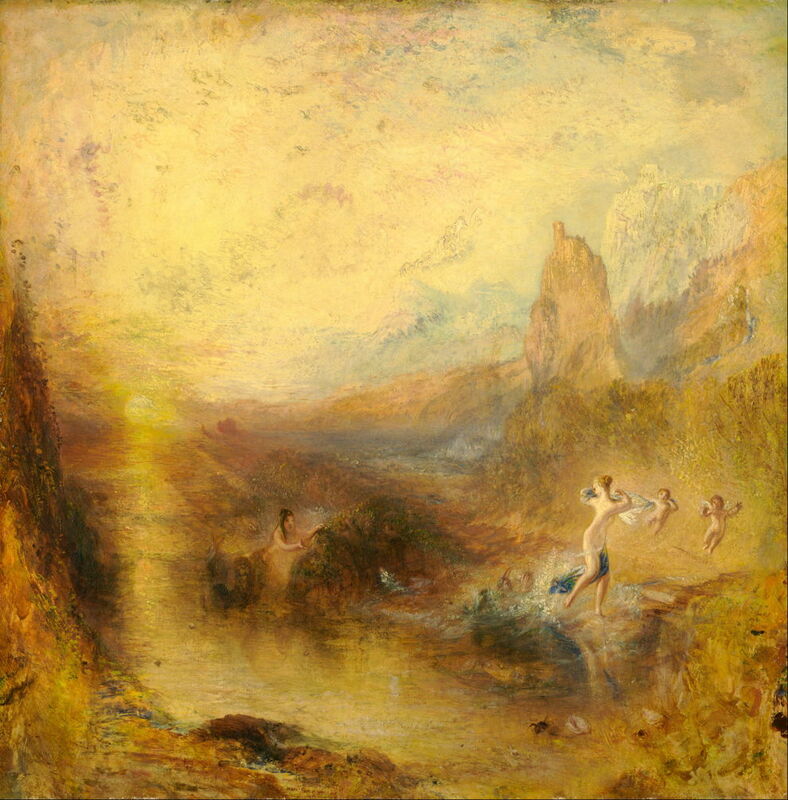 Turner had made an earlier and much more traditional study in about 1810-15, but revised it almost completely by the time that he painted this in 1841. Its light appears influenced by the harbour landscapes of Claude, and its general lack of form anticipates Impressionism, perhaps even Abstract Expressionism in passages. Posted in General, Language, Life, Painting and tagged Metamorphoses, myth, narrative, Ovid, painting, Rosa, Spranger, Turner, Vaccaro. Bookmark the permalink.